There is no shortage of video game—and geek-themed jewelry and accessories across the Netterwebs–-heck, it can be downright overwhelming. So! In an effort to make your life easier, I've rounded up some of my favorite earrings, necklaces, and more from creative up-and-coming designers. Affordable AND adorable–-seriously, what more do you want from me?! 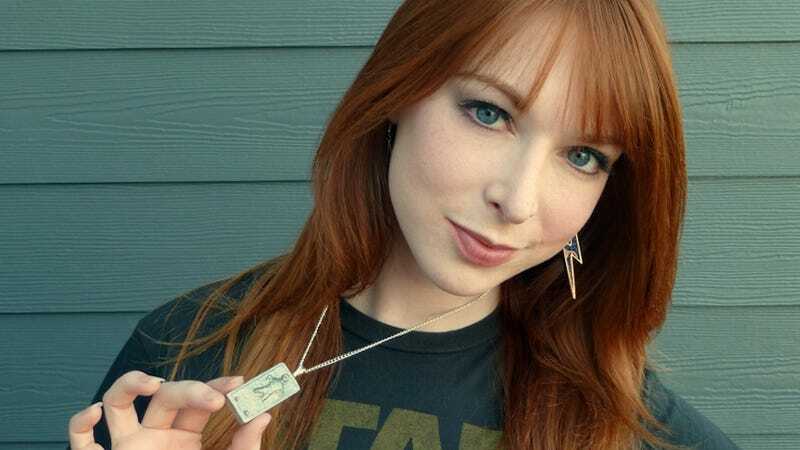 Etsy.com has plenty to offer in terms of nerd jewelry, but Jess from OhMyGeekness has impressed me the most. Check out this mini Han Solo in Carbonite necklace (pictured above). It's detailed, sturdy, and only $15. I can't tell you the number of high-fives I've received from fellow Star Wars fans since I've started wearing this, so if you love Han Solo and high-fiving, this necklace is for you. Also from OhMyGeekness is this mini NES cartridge necklace that I wore to E3. There are different games to choose from—like the golden Zelda cartridge—but I went with Super Mario Bros. 3 because of it being the greatest game of all time. For such a tiny charm, the detail is really impressive. Perfect for the old-school NES fans out there. Buy jewelry and accessories from OhMyGeekness at Etsy. I saw these at Fry's Electronics one day and completely fell in love with them. Hailing from Seattle, WA, Transistor Sister has turned old computer parts into fashionable jewelry. These are my favorite—they're ceramic circuit boards with platinum leads and black film resistors, adorned with hand-crafted silver hooks and black coils. If you or someone you love is a computer geek, I just found you the perfect birthday present. Visit the Transistor Sister online store. My friend Lindsey is the mastermind behind the YOUtiliry Belt, and I have to admit… when I first saw a picture of this product, I thought, "Isn't that a fanny pack?" Well, it's NOT. It's way cooler. Lindsey gave me two of them to try: one black pouch and one red pouch, complete with a little white belt. It hangs on my hip and is incredibly convenient, especially at expos when carrying a purse can get really annoying. The YOUtility Belt comes in many shapes, sizes, and colors, so definitely check out the website and give them a try. This is a fashion trend I can get behind. The YOUtility Belt website and store. I thought those Portal 2 socks a while back were cool, but I like these even more. ThinkGeek describes them best: "Cydaea, the demon Maiden of Lust, was the original goth gal. Black corset, bare neckline, skull leggings adorning her legs… all six of them." Okay, well maybe you don't have six legs, but now you can dress like Cydaea for your next party or for just, you know, lounging around the house. One size fits women's shoe sizes 4 to 10. Diablo III Socks from Think Geek. I pimped these last Monday when "The Game Pitch" video debuted, but in case you missed it, check out these custom cartridge necklaces from Ogeeku. My friend Jon Brence (from SMBC Theater) makes these himself and often sells them at the famous Meltdown Comics in Los Angeles, CA. However, you don't have to live in LA to get your hands on one anymore–-buy them online at the official Ogeeku store. Remember: You tell Jon exactly what you want. Pick the color, the picture, the chain – everything! The "less than three" emote is now the universal symbol for "I heart you," and Metal Smitten has certainly recognized that. They've come out with a small line of jewelry featuring the "<3" symbol. My favorites are the Sterling Silver earrings (for $20) and the rings, but they have necklaces, too, so be sure to visit the site and pick your favorite. It's such a perfect gift for your sweetheart and very, very geek chic. <3 Jewelry from Metal Smitten. There you have it! My geeky picks for jewelry and accessories. If you enjoyed these, check back in the next two weeks for my Geek Chic Update: Clothing Edition. If you have any jewelry, clothing, or accessories of your own, tweet me the links and I'd love to spread the word! Keep the geeky fashion comin'.